Today we’re taking you on a drive through Cameron on US 89 north of Flagstaff. The top half of this video takes you back to 2014, not long after ADOT started a $38 million improvement project. The bottom half shows the same route now that many of the upgrades are complete. The project started with the removal and replacement of the US 89 Cameron Truss Bridge but expanded to include more than three miles of upgrades south of the bridge, which is near the State Route 64 junction about 50 miles north of Flagstaff. As you can see, new features include two northbound lanes, two southbound lanes, a 16-foot wide raised median, sidewalks and a roundabout. We’ve been documenting this project since it began. 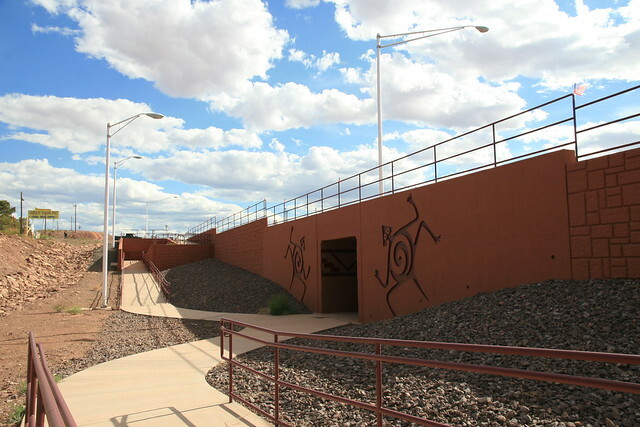 Below is a look at the latest photos, but the entire collection can be found on the ADOT Flickr page. The project should be complete by fall.